What it was like to be a teenager in Saratoga Springs watching one of the highest-grossing movies of all time. It’s safe to say that on December 19, 1997, when Titanic opened in movie theaters, few people expected it to become the highest-grossing movie of all time. (It has since fallen to second in worldwide grosses and third in domestic, but that it remains that high on those lists 20 years later is remarkable.) At first, it was just a night out at the movies-but it became an experience that almost everyone of a certain age in ’97 experienced. What follows is a uniquely “Saratoga” oral history, featuring Saratoga Springs High School students, who graduated in the Class of 1998, preparing for and watching one of the biggest movies of their lifetime. 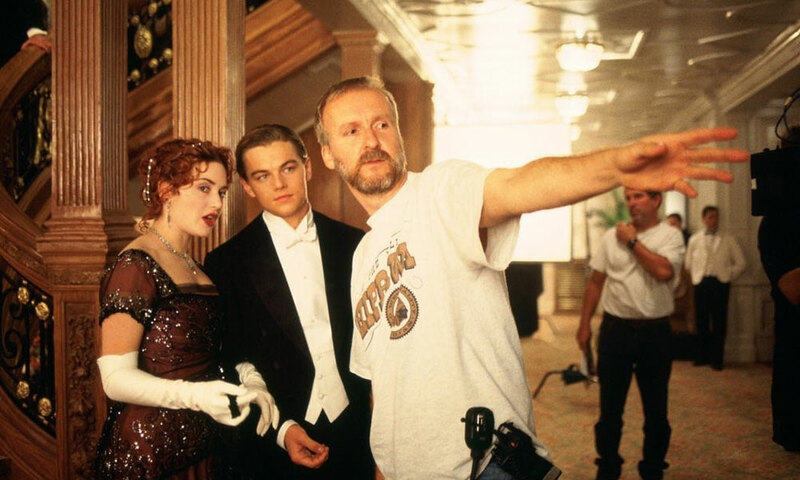 Titanic was getting a lot of press throughout 1997 for the budget-busting exploits of director James Cameron, who had previously made the ultra-expensive Terminator 2 and True Lies. Plenty of movie fans wondered if Titanic would be his first big flop, though plenty of viewers wouldn’t have that in mind when they decided to see it. Jesse Hassenger: Fall 1997 was the first part of senior year of high school for a lot of us. I think that time of life is inherently tumultuous, even when it’s also fun. And it’s not always fun. Maddie Bonneville: That time, around the last month or so of 1997, wasn’t exactly an easy time for me. My parents were splitting up and my sister was away in Russia for a semester abroad. Combine all that with senior year and being 16, and it wasn’t exactly a picnic! It helped to be able to bomb off somewhere with friends and get lost in something for a while. Rob Kuczynski: Maddie was a real good friend. I was dealing with the fallout from a break-up, and she was dealing with her parents, and we would, like, go down to Bogie’s [in Albany] and see [the band] Perfect Thyroid. Jesse: We would periodically try to break a record for the number of people we saw a movie with. Titanic was one of those times. Katie Hoek: All of my knowledge of James Cameron prior to Titanic came from hanging out with [my friends]. I always knew that there was some sort of cultish following. I also loved, loved The Abyss, so that is something. I’m not sure if I knew he directed it, but I’d like to give myself some credit and say that I did at the time. Jeff Prisco: Terminator 2 was my favorite movie for a long time. I also loved The Abyss and Aliens. So it was safe to say Cameron was my favorite director. Titanic seemed a bit of a departure from those movies, but I was game. Jen Chelstad: It was hotly anticipated, 100 percent because Romeo + Juliet came out the year before, with Leonardo DiCaprio. Maddie: I can’t say that I was really feeling any kind of build up to Titanic, or any movie that we all went to see. I enjoyed going to movies with the group, more for the combination of terror and hilarity that driving anywhere with a group of high schoolers involved than any real need to go to the movies. You could probably have asked me who James Cameron was after I saw the movie and I still wouldn’t know who he was. Somehow, close to two dozen Saratoga teenagers made their way to the Crossgates Mall down I-87 to see Titanic after school on December 19, 1997, though accounts differ on how everyone actually got there. But for a small group of us, moviegoing was becoming more of an event, with its attendant habits and rituals. Jesse: It was weird how many big movies we saw at the rinky-dink Wilton Mall theater at the time, which was then a Hoyts. Later it was bought by Regal, and then it closed, and then they put a Bow Tie in there. The theater there now is much nicer than what we had growing up, and so is the Bow Tie downtown. But at the time it was like, where else could you go? Jeff: While we had an acceptable movie theater minutes from all our homes, it was not as good as the larger theater at Crossgates Mall. So for the most “important” movies, we’d drive the 45 minutes to Crossgates. Somewhere along the way we started making a mixtape to cover the transit time. The tape content usually loosely tied to the theme of the movie, and songs were selected for maximum sing-a-long-ability. Jesse: The first one we went to Crossgates was to see Spawn, of all things. But we didn’t do a tape for that one. I think the first movie tape was for Starship Troopers, when it came out in November 1997. [Our mutual friend] Chris Adams made that one and I think we were expecting that he would do a follow-up for Titanic. Rob: The tapes were designed to kind of amp us up. They Might Be Giants, and a lot of Britpop-Stone Roses, Oasis, Blur. Also, ’97, we were getting into techno. Jesse: Chris or [classmate] Matt Robidoux usually drove us to these things. Rob: Chris did a really ill-advised thing where he got into this fight with his mother a week or two before and he was grounded for the only time I could remember. Jesse: I remember feeling panicked about our plans possibly coming apart. Rob: Jesse ended up having to negotiate with Chris’s mother so he could come. Jesse: I called her at work, from school. In retrospect, I can’t believe I did that. I basically pleaded that Chris be allowed to drive us to Crossgates to see Titanic. I didn’t mention that we were trying to break a record for the most people at a single movie. I think I framed it as like, look, I know how it goes, but you’re hurting everybody. Rob: She did not agree to that. She let him go, but he could not drive. So the cars were divided up different than usual. I’m pretty sure we went in Katie’s car. It was me, Jesse, Chris, Katie, and I could have sworn that Bond Caldaro was there with us. Bond Caldaro: My most vivid recollection is that I remember feeling quite excited and honored to join all of you, as I was a bit younger and didn’t often get such invitations from the group. Katie: I’m 90 percent sure that I rode to Crossgates with Matt. Jesse: If we didn’t have a tape, Chris must have been DJing in the front of Katie’s car. Katie: I remember looking at the clock and thinking we had about 22 minutes to get to Crossgates from Exit 14 [approximately 30 miles away]. And I remember Matt saying it would only take 17 minutes. I think it took 22. Don’t tell my mom! He drove there in record time. Matt Robidoux: If I was going anywhere, it was in record time. Katie: I can’t exactly say what antics ensued or what we listened to on the drive. I was more focused on traveling at the speed of sound. Jesse: To make the Crossgates trip worth it, we’d sometimes do double features. We actually went to see Tomorrow Never Dies as sort of a palate cleanser before Titanic, but not everyone joined us. Bond: I distinctly remember that I was invited to join the group as a good-natured lark-to see Bond with Bond! Jen: I remember a helicopter scene and you guys yelling “BOND!” a bunch. Any of that sound accurate? I actually don’t remember if I was there at all. Tom McSweeney: Did they really go to Tomorrow Never Dies immediately beforehand? Man, that would have been a long double feature. With James Bond out of the way and many more Saratoga High School kids meeting up with us, a couple of rows’ worth of teenagers sat down way too close to the screen and settled in for the three-hour movie event of the season. Katie: I remember really loving the movie. I was worried that it would be cheesy or overdone, and it was a little of both of those things but only in really wonderful ways. I also remember being blown away by the cinematography. And really liking the guy who designed the boat; would he officially be the engineer? Architect? I don’t know but I liked that character a lot, along with the whole story being around elderly Rose and the actual sinking sequence. Jen: I was totally confused and bored by the whole old lady with the jewel part. A little uncomfortable with the awkwardness of I’m the king of the world. Otherwise it was awesome. I remember the last half most vividly-Leo [DiCaprio] being handcuffed to the pipe, Leo and Kate [Winslet] running around through the water as the ship started to flood, the orchestra playing on the deck. There was so much detail in the scenes at the end where the ship tipped up and people were flying down into the ocean and hitting stuff on the way down, and in the scenes when people were getting into the lifeboats and then everyone in the water. Oh, and the hand on the car window-that was awkward. So was “draw me like one of your French girls.” Lots of awkward moments. But really excellent disaster action. Maddie: I enjoyed the movie. It had enough of a combination of action and character interest. Oddly, I have most vivid memories of the Irish dancing scene in third class. The other memories are more like single shot images of the ship reaching the peak before it sunk, men stoking the boilers, Jack gambling to get on the ship, and the hand on the steamy car window. Tom: The plot and the dialogue are kind of goofy. Billy Zane’s character is comically evil. When Kate Winslet said “Half the people on this ship are going to die” and he smirked and replied “Not the better half,” I think I might have laughed a little. But the sets and the shots of the boat are amazing. Jesse: I always contend that the shot of the guy falling off the boat and hitting the propeller on the way down is super influential. I feel like every disaster movie afterward had to include a super-gnarly death like that. Jason Forman: At the point where the boat sinking into the water and basically as perpendicular to the water as it can get, someone falls and hits one of the propellers, and I laughed out loud because I thought it was really funny. When I did that the girl sitting next to me hit me on the arm. I feel like it was Bond Caldaro but was she even there? Bond: I probably did punch Jason in the arm over laughing at a guy who hit the boat propeller. Although I’m terribly embarrassed to admit it, it sounds like something my immature teenage self would do. Apart from the enormity of the special effects and historical interest, there was Leonardo DiCaprio. Titanic made him a superstar, but the teenage demographic was already well aware of him. His co-star Kate Winslet, however, was not as well-known. Maddie: I first knew of Leonardo DiCaprio from the adaptation of Romeo + Juliet with him and Claire Danes. I had a typical angsty teen appreciation of all things overly emotional and that movie fit right into that My So-Called Life-type satisfaction I was enjoying at that time. I can’t say I spent a ton of time thinking about him, but he was already on my radar prior to Titanic. Kate Winslet was new to me at that point. Jen: I didn’t know who Kate Winslet was and was mostly disturbed by her through the whole movie. I think I warmed up by the end, but she was no Claire Danes. It look me many years to develop my appreciation for her. Katie: I loved Leonardo DiCaprio: Romeo + Juliet! Basketball Diaries! What’s Eating Gilbert Grape! Needless to say, I was pretty pumped that Leo was going to star in this movie, both so I could gawk at him and because of his incredible talent. I wasn’t so sure about Kate Winslet but as long as Leo was on the screen 90 percent of the time, I knew I would be happy. 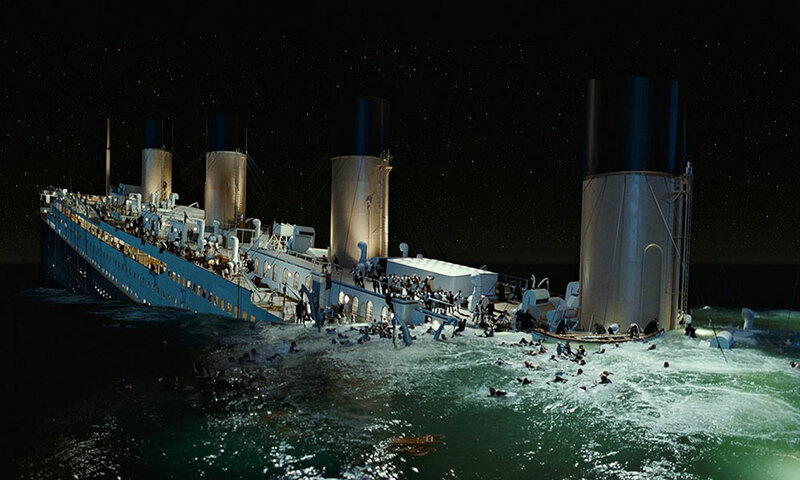 Jeff: I felt going into Titanic, there was a dislike of DiCaprio. Was this just a teenage boy being jealous of how much teenage girls liked him? Was it the ease of “Di-CRAP-rio” jokes? At that point in his career I knew him most from Romeo + Juliet, which I liked a lot. So I don’t think I had specific animosity towards him. Part of this movie’s staying power had to do with its tear-jerking qualities. Maddie: I am sure that I was doing a good job of making sure no one saw me tearing up. I wasn’t quite as comfortable crying in public as I am now. I distinctly remember sitting near Katie, who was definitely crying. There were tears everywhere in the theater, though. Katie: I very specifically remember sitting next to Jen and crying, very, very hard during the movie. We were sitting pretty close to the screen, as we would, down on the floor part and not in the stadium seats. I remember it being one of the movies I cried the hardest at, right up there with Big Fish and Up. Brutal. Jen: So much crying. I was sitting next to Jeff Prisco, and I looked over and he was crying, which was startling because he was someone I never expected to ever see cry. I’m pretty sure it was the door scene. Jeff: As a teenager I don’t recall crying much at all. Not because I was too cool for it; I just didn’t have urges to cry. But during Titanic I don’t remember exactly what part but I remember thinking, “This is sad, I should be crying!” (I guess I thought like a robot back then.) And more or less made myself cry. I like to think I’m a truthful person, so I wouldn’t say I faked it but there was some mental machinations to get there. Maybe that’s when I first learned of human emotions. As karmic payback, now I tear up all the time at random things! Bond: The only thing that stuck with me is that it was cloyingly melodramatic. And too long. I can’t imagine I have the stamina to sit through three hours of overly romantic what-not today. With that said, if there was quiet weeping during the Titanic viewing, it likely included me. Even now movies, shows, or even TV commercials that involve death, gratuitous stress, and hopelessness bring me to tears. Adam Szot: I cried when Leo sank into the icy depths. I felt like him, as I was currently breaking up with my then-girlfriend. Katie: I’m fairly certain I cried the hardest from when the ship started sinking and people starting giving up and saying goodbye to each other, pretty much until the end. The whole scene when Jack dies, of course, and the ending were all remarkably beautiful and sad, especially seeing it the first time. Rob: I don’t want to stereotype the girls in our group or anything, because they’re all more interesting people than I am, but movies we went to where Katie cried: Titanic. Saving Private Ryan. City of Angels. American Pie. Jesse: Hey, I cried at City of Angels too. I feel like Titanic kind of opened the floodgates, actually. I cried at way more movies after December 1997 than I did before. It was a sensation at the time. But how do people feel about Titanic in retrospect? Jesse: For all that, Titanic wasn’t even our group’s big record-breaker. That was Star Trek: First Contact, in 1996. We got like 26 or 27 people to go to that one. For Titanic we only mustered about 20. Some of our friends sat it out. Jared Henley: I didn’t see it until a few years ago. I boycotted it at the time because of its exorbitant budget. I don’t know why that mattered to me. Nikola Bolas: I eventually saw it years later. I know my sister was all about it, which made it anathema to me. Rob: I actually didn’t want to go. In some ways, in senior year, our friend group started to fracture. I’ve described it as the guys into sci-fi and the guys into fantasy. Jesse: I don’t remember that particular outing as fractured, but it was definitely the transition from trying to get as many people as possible to go to a movie with us to maybe keeping it smaller and not trying to cajole everyone into getting excited about what we were excited about. The next really big event for us as a group was the 1998 version of Godzilla, which came out right before we graduated that spring. We had like two cars’ worth of people, max. And then there was kind of a reunion a year later when Phantom Menace came out. But I don’t think we had as many people there as we had for Titanic. Jason: After Titanic came out in the theater, I was walking in New York City, and I saw a bootleg copy that came on two VHS tapes. I bought it [for] 10 bucks, I believe-and brought it back to Saratoga. I watched it at least twice at my house with two different lovely young women. Chris Adams: I’m pretty sure we got a two-VHS [copy] of it the next Christmas… and possibly never watched it? That might be a story often told. That VHS is probably still in my mother’s hoard. (I can mail it to you, if you want.) See it the way it was meant to be seen. If you need a name for your Titanic extravaganza, here’s one: Peak Billy Zane. Tom: [My wife and I] actually own it on DVD. I like to watch it during the winter. It feels like a winter kind of movie. It’s usually the kind of movie I put on in the background on a Sunday afternoon, or something like that. 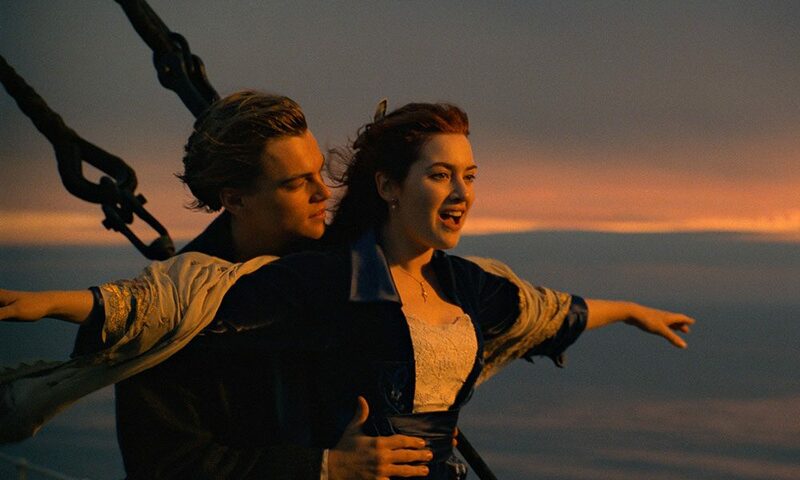 Jeff: Because of the eventual backlash against the movie I feel like Titanic is referenced today as more of a joke. I can’t think of the last time I saw it as a movie but I probably made a “King of the World” joke last week (granted, I spend a lot of time on boats, so maybe that’s just me!). Jesse: I saw it two more times when it was in theaters. That’s the best way to see it, but I still love it. Even more than Star Trek: First Contact.